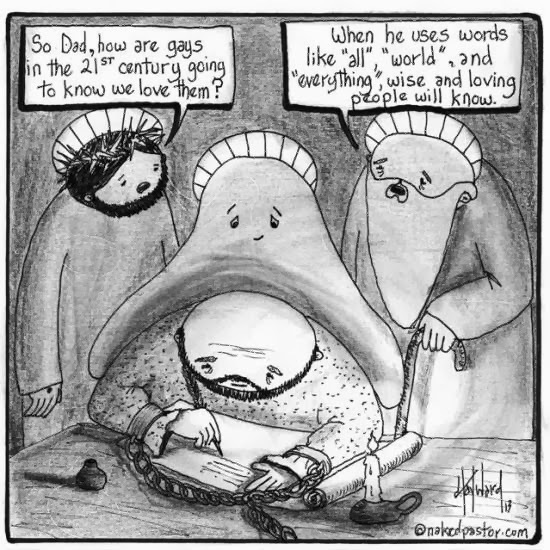 Jesus in Love Blog: Cartoon: How do LGBT people know God loves us? It’s a bittersweet answer. 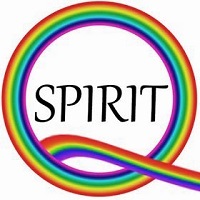 Yes, wise and loving people today can understand that LGBT people are included in scriptures such as “Since everything God created is good, we should not reject any of it but receive it with thanks.” (1 Timothy 4:4). But sometimes it’s frustrating that the Bible’s anti-gay “clobber passages” seem so much more specific. Maybe the implication here is that God did not inspire those verses. Why not a clear message for the not-so-wise and less-than-loving people? What about the LGBT people who believe the lie that God rejects them? Hayward uses the traditional image of God as an old man to critique the way that straight white men dominate Christianity. He started a blog called “nakedpastor” in 2006, offering a progressive look at religion through his art, cartoons and writings. The artist behind “nakedpastor” literally was a church pastor. After growing up in various denominations, he was ordained a Presbyterian and pastured a Vineyard church. He has a master’s degree in theology from Gordon-Conwell Theological Seminary and a diploma in religious studies and ministry from McGill University in Montreal. In 2010 Hayward quit the professional paid clergy because, as he puts it, “"the church and I were no longer compatible.” His art, cartoons, writings and book have found their way all around the world to entertain and challenge people. He and his wife Lisa live near Saint John, New Brunswick. Hayward is the author of two books: “nakedpastor101: Cartoons by David Hayward” and “Without a Vision My People Prosper,” which calls the church back to the priority of fellowship over accomplishments. Well, I saw your post in my email today, and with it, the cartoon. So I came along to read your post, prepared to make a slightly grumpy post about "why did God choose to hide his love for only good & loving..." But of course, Kitt, you and the artist do a magnificent job, far better than I could have, discussing that very point! I often wonder about that same question Jesus asks in the cartoon. And in my mind, when God makes that answer, Jesus looks at him with disbelief, the classic "jaw hit the floor" look, and says "Get real, Dad! You know what humans are like! We need to be more specific!" Oh, and by the way, instead of an old white man, I sometimes think of God as a 6 year old asian girl. The kind of child we would look at, patronizingly, as she speaks words of wisdom... and then she gives you "that look" that cuts deep into one's soul and says, merely, "really?". I’m happy to report that after seeing how I presented his cartoon today, David gave me permission to share his work at Jesus in Love anytime. 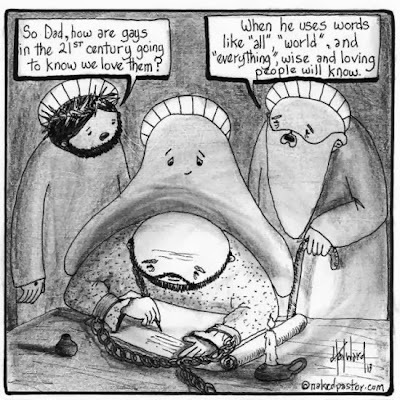 So stay tuned for more great cartoons on LGBT Christian themes. I like your image of God as a 6-year-old Asian girl! The cartoon begs the question of the origin and authority of the Bible; when I consider some of the passages--not just the ones authorizing, even commanding genocide, but the savage penalties for the violation of primitive mores, I have to reject the Bible's claims to divine authority. Christians want to have it both ways; they want to invoke the Bible to punish those who are different from them, but the blithely ignore the parts that would restrict their own freedom. For example, what non-Muslim woman today would obey Paul's injunction to keep her head covered and her mouth shut in church? Yes, this cartoon assumes that the Bible was inspired by God. My own belief is that God did inspire the Biblical writers BUT the inspiration was filtered through human consciousness and culture… so it must be interpreted and applied carefully if at all. Certainly there are many contradictions within the Bible itself, such as the commandment “thou shalt not kill” and the passages you mention that allow genocide. I’m glad that the cartoon itself is an inspiration for debate and reflection.